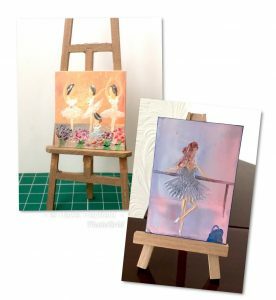 My first miniature art paintings for 2019 have a theme of Ballet. My Dolls House screens (room dividers) have been very popular over the years and I like to try new topics and subjects but I haven’t done ballet before, even though my ballet dancer paintings are well received. So for the new year, the theme is Ballet….. The middle screen shown here is in fact twice the size of the other two and first one I painted last week. It’s for a 1:12th scale dolls house, I’m calling it “Flower Ballet” as the ballerinas are surrounded with flower bouquets as they might be at the end of the performance. This is a unique one of a kind piece of art as miniature furniture. 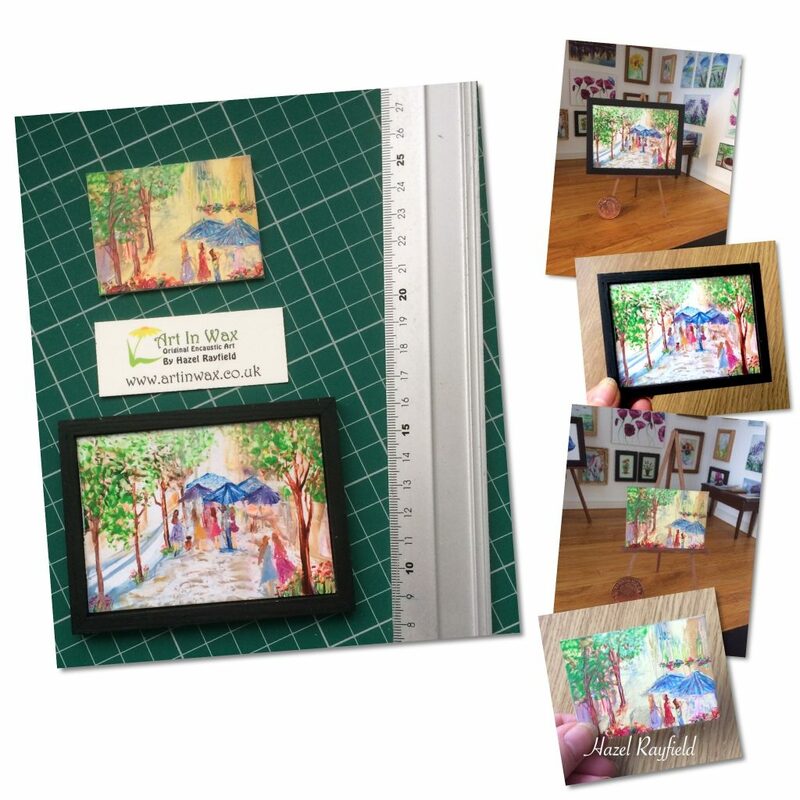 This three panel screen is an original piece of art, the panels are painted in encaustic wax paint on card backed onto 2mm mount card and paper taped to give the concertina effect, the back has coloured paper backing. The size of this piece is 12cm high, the outer panels are approximately 3cm wide and the middle one is 4cm. In contrast the other two screens are for a 1:24th scale dolls house and are very tiny and delicate, with the height being just 7.5 cm and 8cm respectively. 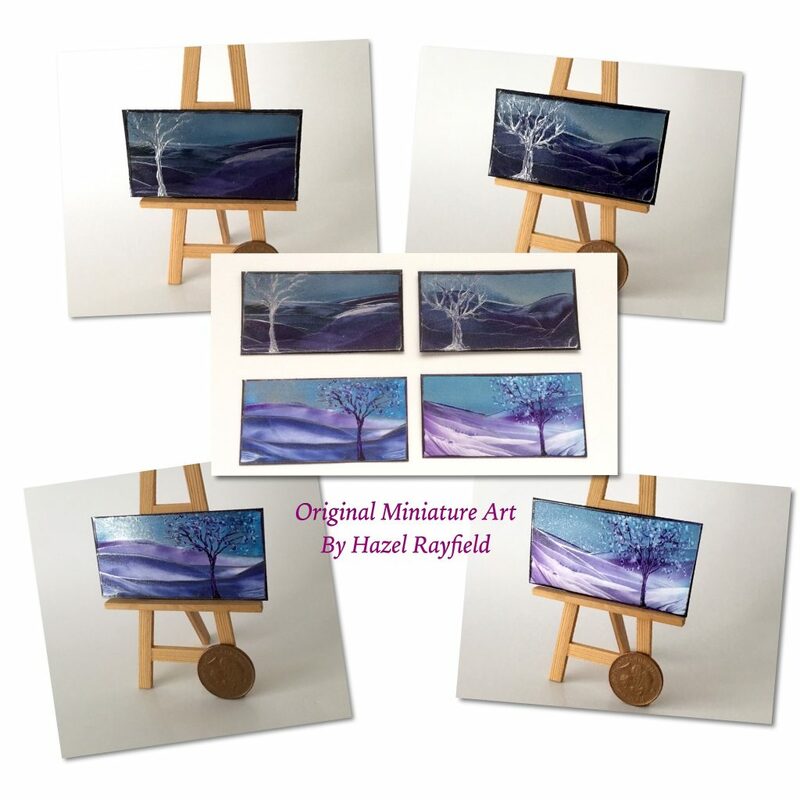 I truly believe that art, as with beauty, is in the eye of the beholder and with this in mind my new miniature dollhouse paintings shown here say to me, that as we start a new year in 2019 I am looking at “New Horizons” and yet, I am also thinking about my roots and the ages that have gone before. The strength of the old tree still standing strong, younger trees growing new branches and also to know the new life coming in the blooms of Spring leaves ….. 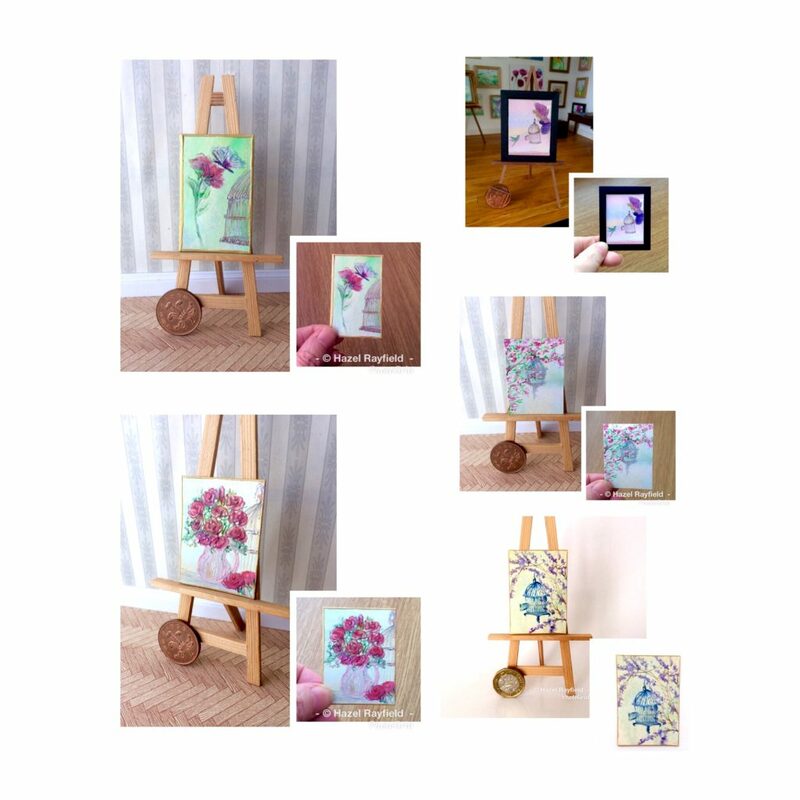 I am hoping these new pieces of my miniature art will mean and show different things to different people …… I know what I see …… But what do you see ? I finished these two new miniature pieces of my original encaustic art this week. I’m calling them “Spring Café” which is 45 x 60 mm and the framed one is 4×3 inches is “Meeting up at the café. Spring Café has ladies outside a café on a tree lined avenue, featuring building and shops with flowers and flower boxes on the walls. As I say, I’ve gone a little more impressionist with my paintings for these pictures. The street scene, Meeting up at the café is a fun piece with people gathering for coffee at a street café. Their is lots of details to keep the interest and this was a fun challenge to paint. You are currently browsing the archives for the Dollhouse Paintings category.